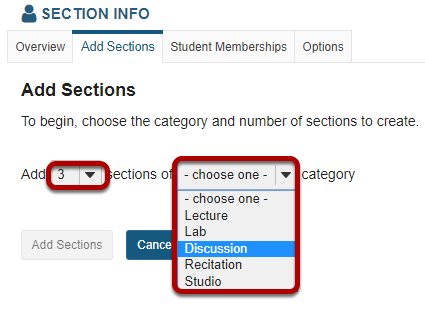 Sakai Community DocumentationSakai 19 User Guide (English) Section InfoHow do I create a section? Sections may or may not be populated with official course data, depending on implementation. If they are not automatically created, then you may create them if you have the appropriate role. Participants (e.g., students) cannot create or modify sections. Note: If your implementation has an automatic feed, you will have the option to automatically or manually manage section membership from the Options page in the Section Info tool. Membership information can be based on official registration information, or you can discontinue section and membership updates from the registration system and manually control everything. However, when you select manual mode and then return to automatic mode, you will lose all the changes you made while in manual mode. Select the Section Info tool from the Tool Menu in your site. Select the number of sections and a category. Note: The name of a category is the only thing that differentiates it from other categories. For instance, a Lab section will function exactly as a Discussion section in the Section Info tool. Name: In the Name field, give your section a name. If you don't enter a name, the name of the category plus a number will be the default name (e.g., Lab1, Lab2, Lab3). Section Size: Choose a either Unlimited number of students in section or Limit number of students in section to. For the second choice, enter the maximum number of members allowed in the section. 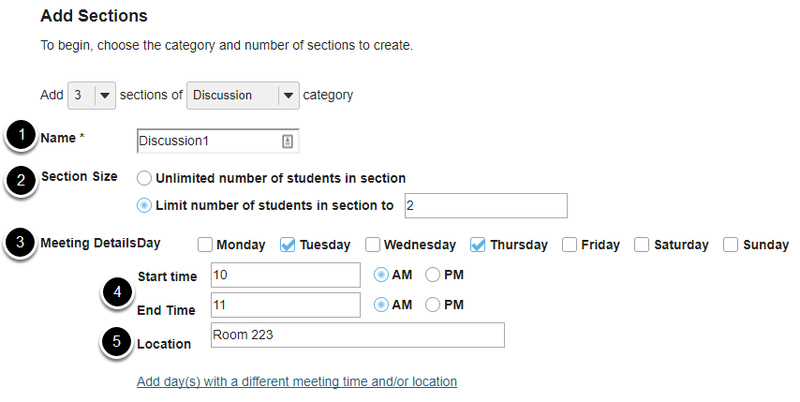 Meeting Details: Select which days of the week this section meets. Start/End Time: Enter the time the section meets. Enter the time and minutes, for example, 8:00. Check next to AM or PM to indicate time of day. Location: Enter a short location identifier for where the section meets, up to 20 characters maximum. If you have chosen to add more than one section at a time, repeat the process above for the other sections. When you are finished entering your section information, click Add Sections. Prev: How are sections different than groups? Next: How do I edit a section?